I owned a pair Leki Yukon trekking pole and had not really put much attention into it until the last hike in Syue Shan when I found a basket and a stopper along the trail. Previously I did lost one of the basket during one particular hike and it started to make me think. So here I have made some provision to the trekking pole. I do not need a basket unless it is a sandy or snowy ground, so I have remove the other basket on the trekking pole . I do not have any stoppers on my hiking pole and did advise some hikers not to use them. By placing a rubber stopper, you do not get good grip on the ground with a trekking pole. Rubber stopper are used only in certain places like ancient ruin sites that requires to have it on otherwise you will be damaging the ground. Also on certain concrete paved road when it reduces the sound hitting the ground. Most trekking pole end tips are made of a very hard material called "Carbide" which is hard to damage, so you do not have to worry too much on the tip. By removing both of these items, you prevent yourself from littering the trail unintentionally. There are some argument about trail conservation that the trekking pole tip will damage or injure the tree roots. I would only say, the trail should not open in the first place. Trails are open so that you can hike, and damage the designated path but not out of it. If you are a conservationist, then you should not hike the trail at all. So what did these conservationist left behind? These are the items I found from Syue Shan Hike. If you notice on the rubber stopper there is a hole at the bottom. This is clear indication the stopper is useless after sometime. The first step, I removed the basket but need to protect the thread on the trekking pole. To protect the thread for the basket, I used a electrical tape and not a duct tape to wrap around. Electrical tape are more stretchable as it binds to the shape. 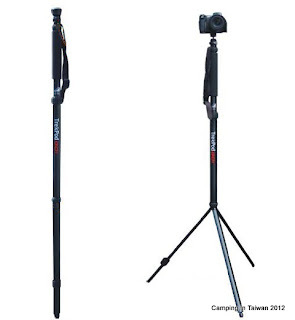 Now to turn my trekking pole into a camera monopod, I found a cheap camera stand with flexible legs. This can be purchase from Diaso for NT39. After much experimenting, soon realise I could mod this easily without damaging the trekking pole. Secured with bike inner tube band on the trekking pole tip, I would suggest to add another band in the mid section. It is strong enough even to hold a SLR camera. For added strength, you can use a hose clamp with butterfly screwing handle. both the camera stand legs are wrapped inside the handle to get a better grip. I found using Velcro Tape holds it better. However in my opinion this is not strong enough to hold a SLR camera. But this configuration can make into a camera stand by sinking the trekking pole into the ground. I have yet to try but will update if this works. now I can take a picture of myself in a bigger background with the trekking pole extended to my desire length. I like that you are using equipment that you have on you anyway. I good idea for taking pictures of yourself without having to carry extra stuff. Genius idea. You really an outdoors man. You easily come up with ideas. I admire your creativity. Any more ideas? I'm looking forward for more of your "inventions". That is a great idea. Combining things like that and getting the most use out of everything you have! I was looking for Tripods that offers me the basic functionality without having to attend a training session to learn using it and the AmazonBasics 60-Inch Tripod was indeed the right choice. This is a versatile tripod that you would love to use.